Here are my first takeaways on the Sports Illustrated articles outlining unethical behavior in the Oklahoma State University football program. (1) I find it telling and somewhat sadly typical that our state media outlets, most notably the state’s two largest newspaper, The Oklahoman and the Tulsa World, were completely trounced on this major story by a magazine outside the state. Where are the state’s watchdogs? Why are we, taxpayers who help support OSU, just now hearing about these allegations? No one expects the game-day beat writers for OSU to have the time to focus on the larger picture of corruption in college football, but supposedly we have investigative reporters in this state, right? Is the fact that the state has a weak and complicit media a major part of this story as well? On a media level, the OSU scandal has to certainly remind everyone of the Reuters’ stories about Chesapeake Energy and SandRidge Energy in this way: It took someone from outside of Oklahoma to break the news of something extremely important to many Oklahomans. It’s like how the federal government has to rescue us from ourselves time and time again. (2) The fact that there’s so much state interest in this issue is a case of misplaced priorities in Oklahoma. How about the issue of declining funding from the state for higher education over the last several years? What about students who have to borrow large sums of money these days to even attend college at OSU? 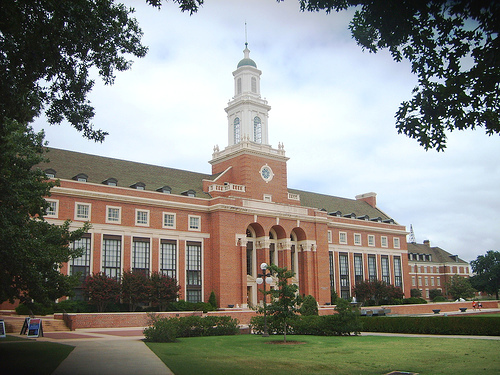 What about OSU’s academic mission as it applies to the vast majority of its students? Gosh, what about the water problems the university is experiencing right now? The water coming out the tap at OSU is a gross brown-orange color, but, hey, supposedly it’s safe to drink. There’s nothing wrong with following your favorite sports teams, but once the game is over, it’s time to get a perspective. In the end, it’s only a game. There are a lot more important issues that will impact the state for years to come going on at OSU, including its research programs. (3) The academic-corruption allegations raised in the story today is an important issue that impacts the entire university. What is a degree worth from OSU if coaches and others there condone and even help athletes cheat to stay eligible? (This is coming from an alumnus.) Are there other pockets of academic corruption at the university? How much did administrators know about the cheating allegations raised by Sports Illustrated? Just because they didn’t know it was going on doesn’t mean they shouldn’t have known it was happening. OSU’s professors, through their faculty senate, colleges and departments, need and undoubtedly will stand up and say they will not tolerate the type of cheating outlined by Sports Illustrated today. (4) The fact is that most of the media coverage here about the media coverage has been mostly antagonistic to Sports Illustrated. Fans and former players have weighed in on social media attacking the magazine and just simply categorically denying the issues raised in the stories. OSU administrators have been more balanced in their response, but far too reserved. The overall way it looks from the outside is that the Cowboy nation doesn’t seem to care about the substance of the stories. As I stated earlier, yes, it’s just a game, and maybe this is the way it works at all big-time college football programs, but it still deserves a response with some measure of contriteness and humility. It’s better to err with this type of response than err with petulance and disdain for the people raising the issues. The OU and OSU rivalry, now exploding on Facebook, as it pertains to which university’s football program is the most corrupt speaks for itself. No, OU is more corrupt; no, no, it’s OSU. That’s what we talk about here in Oklahoma as funding declines for education and thousands of people go without health insurance. Maybe that’s the problem.